I’m working on some more substantive posts, but meanwhile, here we go again: a random claim that the trains used to be faster than today. Yes indeed something is wrong with this picture: it’s not true. Let’s take off the rose-coloured glasses. Once again via Mark Bau’s excellent timetable web site, the 1954 timetable shows the fastest train to Geelong was 55 minutes, nonstop, at the not-very-convenient time (at least by today’s standards) of 8:25am (outbound). The more useful (for Geelong to Melbourne commuters) outbound train at 5:10pm (the “Geelong Flyer”) took 57 minutes — also the time of the fastest inbound train. The 6:10pm outbound train took 60 minutes. These were all nonstop. Trains that stopped along the way, therefore were useful to more people using intermediate stations (remembering that Werribee was part of the country service back then), took around 77 to 100 minutes — the slowest being the 7:05am Melbourne to Geelong, stopping along the way at North Melbourne, Footscray, Newport, Laverton, Aircraft, Werribee, Little River, Lara, Corio, North Shore and North Geelong. The fastest train I can see in the 2017 timetable takes 55 minutes (5:33pm outbound from Melbourne), the exact same time as the fastest train in 1954. This not only takes a longer route via Regional Rail Link (about 81 Km vs 72.5 Km via Werribee), but it also makes three stops along the way: Footscray, Sunshine and North Geelong. The fastest inbound trains are 59 minutes, for instance the 7:23 from Geelong, stopping at North Geelong, North Shore, Corio, Lara and Footscray. Most other trains take 62 to 65 minutes, and have more stops. The slowest I can see is 68 minutes; the weekend lunchtime and evening trains from Warrnambool, for instance the 1:49pm from Geelong, stopping at North Geelong, Lara, Wyndham Vale, Tarneit and Footscray — a diesel loco-hauled train, which has slower acceleration than the newer V/Locity sets commonly used on the shorter-distance services to Geelong. This is not to say V/Line shouldn’t be better. I’ve written before that their timetabling results in unnecessary conflicts and delays, and how their departures from Southern Cross are a complete mess. 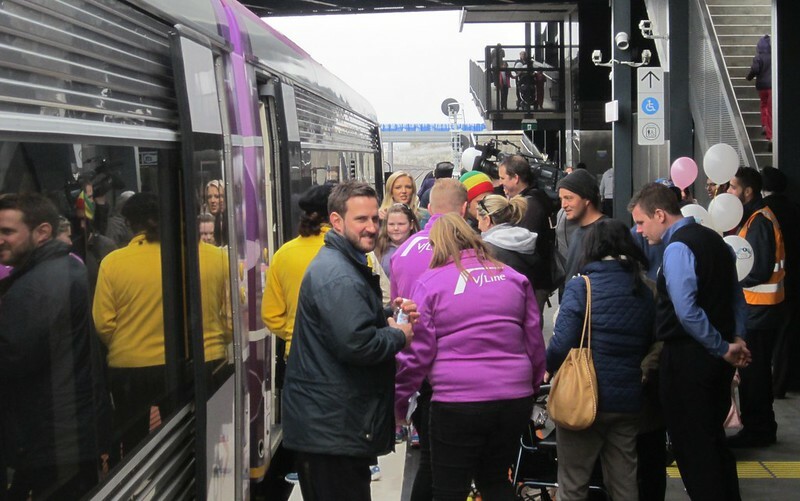 The operation of the new Regional Rail Link track, opened in 2015, which gave them their own route from western Melbourne into the city, leaves a lot to be desired. For instance, inbound V/Line trains are given ten minutes between Footscray and Southern Cross — amazingly, this is two minutes more than most Metro trains, which make an additional stop at North Melbourne. Sad! Still, the fact remains that the Geelong line is just as fast as it was in the 1950s for express trains, and in fact is much faster for services that stop along the way. And this is despite there being far more trains on the line today — back in 1954 there were only 9 trains per weekday to Geelong. Today there are 44. Similar claims about the 1930s appear to be equally untrue. The fastest trains in 1928 were 63 minutes, the slowest around 100. Update 4/4/2017: Another example in last night’s Channel 9 News, where one gentleman reckoned it was faster from Melbourne to Wodonga 50 years ago. Once again, checking the timetables shows he’s incorrect. 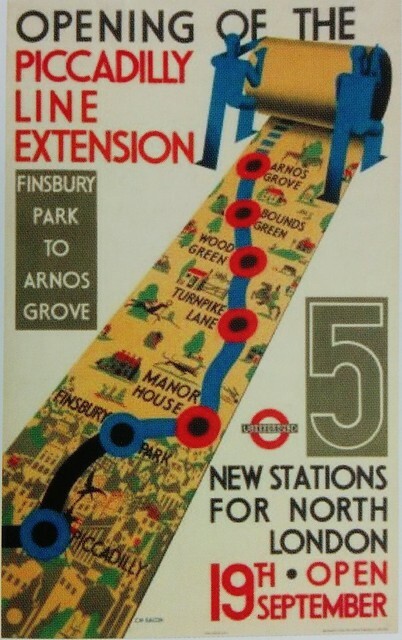 The 1967 timetable shows it was at least 4.5 hours then. The current V/Line timetable shows it’s now 3.5 hours (delays excluded). Today the Geelong Advertiser claimed “Geelong trains to Melbourne slower now than in age of steam”. Federal MP Sarah Henderson repeated the claim on Radio National, and doubled down when quizzed about it on Twitter. It’s nonsense of course. 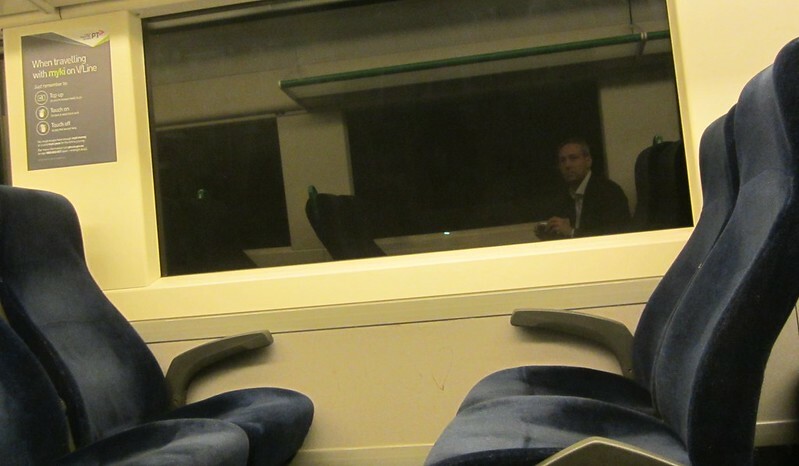 The fastest train then was 55 minutes; the fastest now is 55 minutes. So how did the Addy reach this conclusion? In separate article they went into some detail. A search a current V/Line timetable shows the average travel time for the 10 Melbourne to Geelong V/Line services after 5pm on a Friday night is 61 minutes. So instead of comparing the fastest then to the fastest now, or the average then to the average now, they’ve compared the fastest then to the average now. So an average of 73.5. Which is more than 61 today. Not so impressive then, was it? V/Line has a lot of issues. Being slower than the 1950s isn’t one of them, and distracts from fixing the actual problems. In fact, just as happened today, it allows the government’s response to focus on discrediting the comparison, and get away without addressing the issues. If we’re advocating for change, we can do better. In today’s Age, former National Party leader and Deputy PM Tim Fischer is quoted as saying the new Regional Rail Link should have had a flyover where the Geelong and Ballarat lines converge. And due to congestion, trains sometime have to wait for five minutes for the track to be clear, he said. But as always it’s not just infrastructure, it’s also operations. On my little jaunt to Geelong a few Saturdays ago, coming back I noticed our train slowed before joining the Ballarat line. 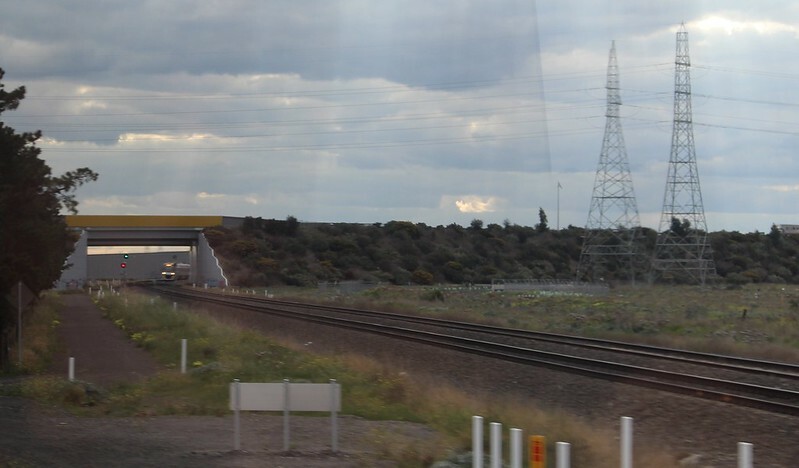 And as shown in the photo above, a train from Ballarat was also approaching… it slowed and waited for us. The train I was on leaves Tarneit at 15:27, runs express through Deer Park and Ardeer, getting to Sunshine at 15:39. The Ballarat train we saw leaves Rockbank at 15:26, Deer Park 15:38, Ardeer 15:41, Sunshine 15:44. Given the extra stops, it’d be reasonable to assume the Ballarat train is timed to arrive at the junction within 2-3 minutes of the Geelong train. The timestamp on the photo, which hopefully is accurate, is 15:35. It gets worse: another outbound Ballarat train is due out of Deer Park at 15:35. This was a weekend, when both those lines run hourly. Why on earth would these trains be timetabled like that, within a few minutes of each other? In this case the train from Geelong delayed an inbound Ballarat train, but running late could easily delay Ballarat trains in both directions… every hour, every weekend. So Mr Fischer makes a good point needing to invest to avoid congestion — flat junctions cause problems, as does single track — but some of it is avoidable through a little more thought in the timetables. Trains from the city to Geelong depart regularly, but from numerous platforms — when I was there in peak, it was 5A, then 7A, 15A, 1, 3A… and when I’d been there at lunchtime, 2B had also been in the mix. It wouldn’t hurt to have some consistency. As it is, if you just miss a train, you’re likely to have to backtrack a long way to figure out where to catch the next one. I caught the Southern Cross to Tarneit on the 17:44 to Geelong/Waurn Ponds — peak hour, quite crowded, every seat on the 5-car train occupied I think. A few people standing (probably by choice). Tarneit station quite busy, perhaps 100 or more people alighted there. Not bad for the fourth weekday of operation. The area around the station is somewhat dominated by the car park (hopefully new development on the northern side will reduce this. Good to see the platforms have multiple exits. Hopped on another train to Wyndham Vale a few minutes later — not nearly as crowded. Then a train back into the City — counter-peak, mostly empty. It was late, and the departure disappeared off the platform screens for a few minutes, a bit odd. 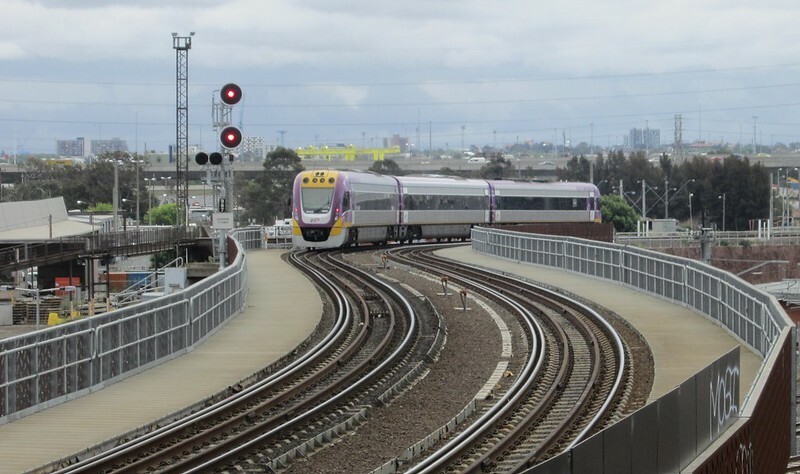 Notably, a lady hopped off the inbound train at Sunshine and changed onto the Sunbury line outbound, so while no doubt Geelong to Werribee people have been inconvenienced having to now make a bus connection, the opening of RRL has also made other trips easier. 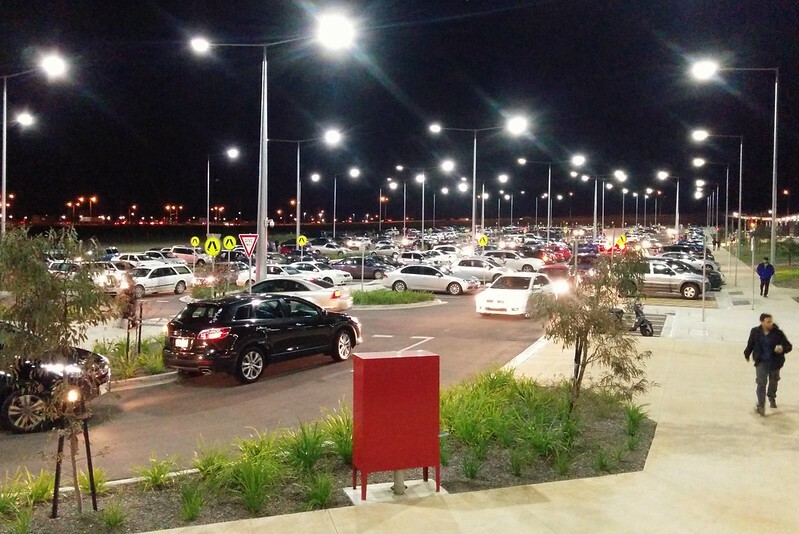 Despite it being after 6pm and dark, I saw no sign whatsoever of PSOs at either of the new stations. They are not currently on the list of stations served by them, which seems odd. It was too dark to see any scenery on this little jaunt, or even to fully appreciate the speed. There was a brief good view of the bright lights of the distant city between Deer Park and Tarneit. I’ll have to go back in daylight. It’s great to see a brand new rail line so popular already. 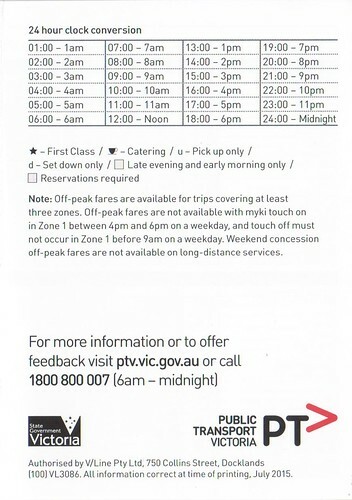 24-hour time isn’t common in Australia, but V/Line uses it. 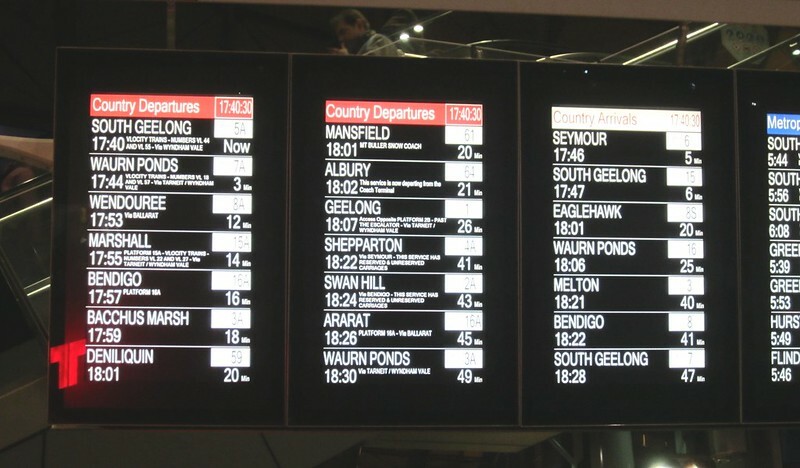 It’s on their web site, on the screens at Southern Cross, and on their timetables… in fact the paper timetable has a panel explaining 24-hour time. Oddly, it’s not on their Passenger Information Displays at their stations. 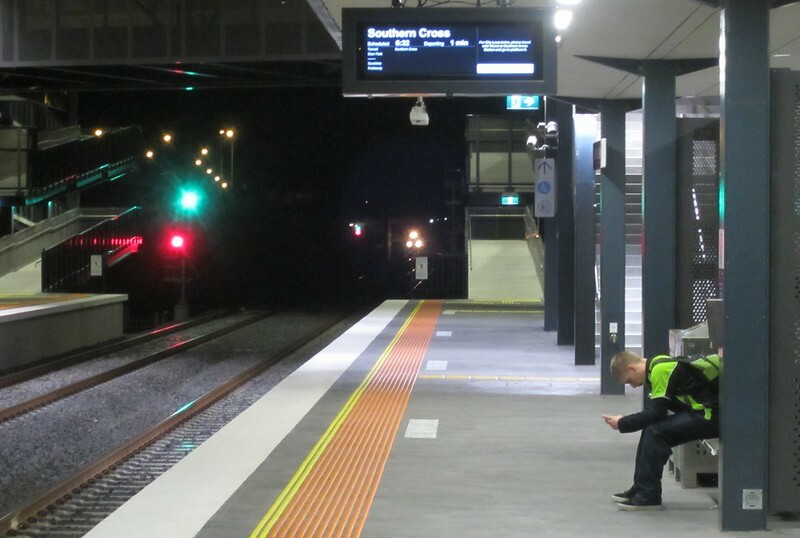 They all seem to be 12-hour time, even on the new platforms which exclusively serve V/Line trains. Is it important? Not greatly in the grand scheme of things. But some consistency would be good across the greater public transport network of course. I’m undecided which is better… 12-hour time is more well and understood, but 24 avoids AM/PM ambiguity, and most people would know it from the world of air travel. It’s also used internally by operators. It’s not the first time we’ve had inconsistency on this in public transport. The Metcard system used 12-hour times on the cards and readers, but from memory used 24-hour time when the readers showed expiry times. I’ve been watching The Killing Season, the story of Labor and the switches in power between Rudd and Gillard. It’s really good, and episode one goes into some detail about the Global Financial Crisis, and the Rudd/Swan stimulus packages (two of them, totalling almost $60 billion) to fight it off. The stimulus package was intended to spend money fast — the school halls and home insulation programs were evidence of that — some good outcomes from better school infrastructure and improved energy efficiency in thousands of homes, but fundamentally rushed and poorly planned. Something that people might have forgotten is that Regional Rail Link was funded as part of the stimulus package. The Victorian government bureaucracy had been throwing the idea of a “Tarneit bypass” for the Geelong line for some years, in association with extending the Urban Growth Boundary to to encompass it. If the GFC hadn’t happened, and if RRL hadn’t been close enough to ready to go (despite it being described later as costed on the back of an envelope) it may not have happened. Or at least, it might still be on the drawing board, perhaps overtaken by the Metro rail tunnel. 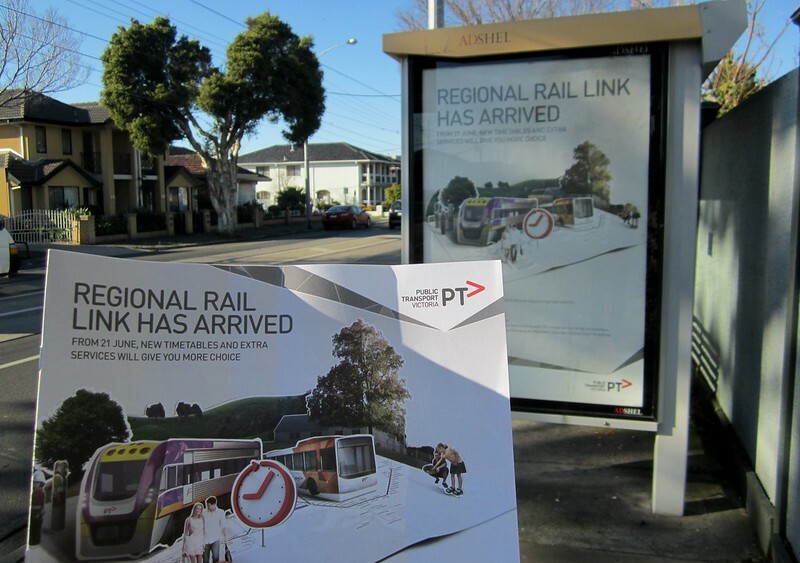 Even with the haphazard pre-planning — and for years the PTUA tried without success to get answers on the proposed changes to train schedules as part of it — it’s turned out well, perhaps far more so than the school halls and home insulation. There are similar travel times from Geelong, despite the longer distance. Yes, they could have prioritised faster express trains, but these eat up track capacity, reduce frequency/service to skipped stations, and save little time (a minute or two per station). 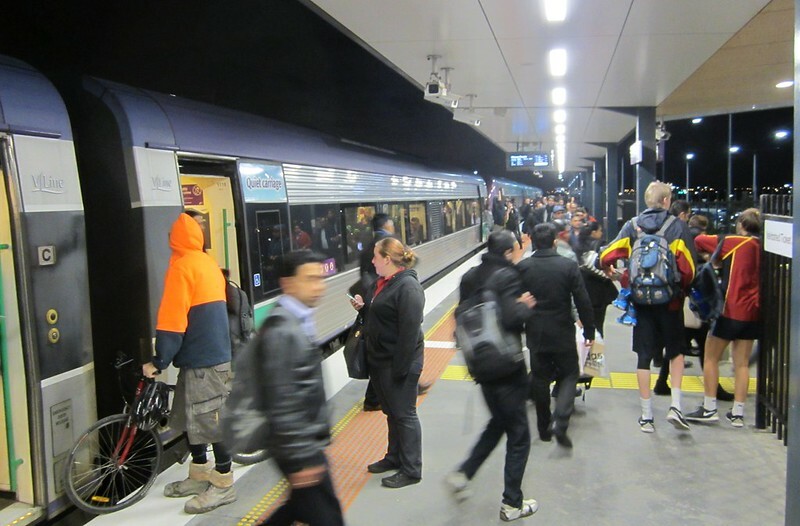 Thankfully, lessons have been learnt since the Regional Fast Rail project’s “flagship” trains — which were a near-pointless attempt to provide a single fast train per day from the commuter-belt into Melbourne. There’s some express running, but regular, more frequent services are far more valuable to users. Importantly, the new stations (plus Deer Park) in the growth areas get decent rail services (at least on weekdays), with trains every 20 minutes most of the day, and timed connections to and from a re-designed local bus network. I went along to the Wyndham Vale station open day on Saturday. 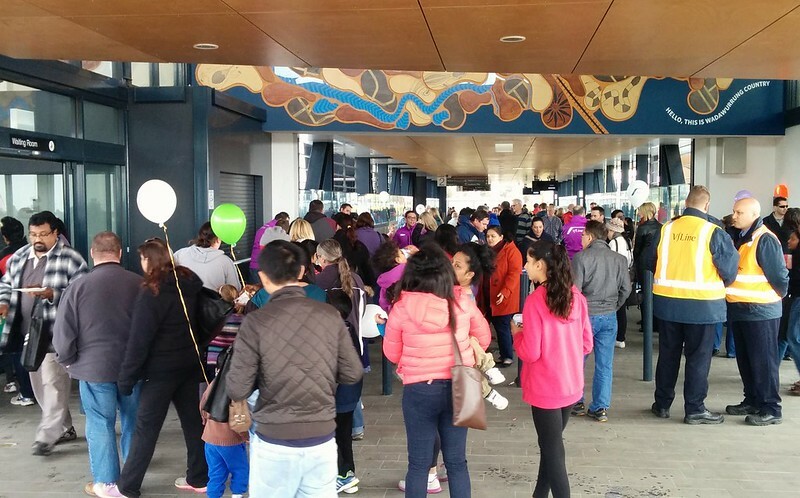 It was very busy, with obviously a lot of interest from the locals, and (as at the opening of Lynbrook some years ago, overheard some saying they planned to start using the trains to get to work). There are niggles: connections to Werribee and North Melbourne may be difficult for some passengers. And crowding may be an issue at peak times for trains originating in Geelong and serving Wyndham Vale and Tarneit — hopefully PTV and V/Line will monitor this carefully and deploy extra carriages as they become available. Flagstaff was going to open on weekends — not yet! Hopefully it’s full steam ahead on these important upgrades to keep the network improving. Before you read too much of this post, play the video and (assuming you haven’t seen it before), see how long it takes you to work out what it’s an ad for. Gosh, isn’t it optimistic! And I’m finding it really catchy. Even the bloke at the end seems pretty happy, perhaps with good reason. That ad seems a bit long for television; perhaps it was in cinemas, or perhaps it was online only — though it seems there was a shorter version for TV. Meanwhile, I’ve just finished reading Mark Ovenden’s excellent book London Underground By Design. Both the Washington DC ads above and the book show examples of rail authorities that are aware of the importance of promoting their new rail lines. 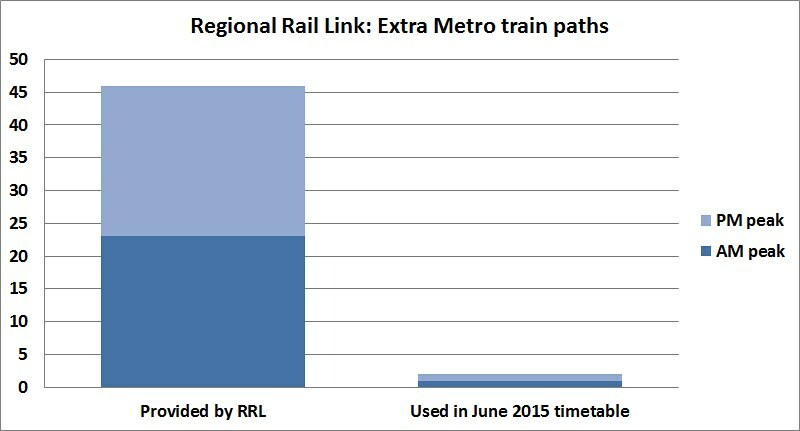 Today it’s a month until Regional Rail Link opens on 21st of June, and there’s been no promotion of it at all. So far I’ve seen no posters, no ads, nothing online (the official project web site doesn’t even seem to indicate the precise date; it only says “June”), and recent media stories about it (not since the ones advising that the opening was delayed). I’m told even the new rail map, which would have highlighted the new line to Metro users, has been delayed until later in the year. This is a real shame — it would have been a perfect way to promote the new stations to existing users, including those who might currently be driving from nearby suburbs to the overcrowded Werribee line. Way to get people excited and interested in the first new major suburban rail line to open in 80 years! Let’s hope local residents hear about it opening. At least they’ve seen construction going on. But wait a minute, I hear you say, why does the rest of Melbourne need to know about this? I don’t live anywhere near Tarneit and Wyndham Vale; how will it help me? As former Western Australian transport minister Alannah MacTiernan pointed out in a presentation in 2013, when the new Mandurah line opened in Perth, it actually resulted in patronage growth right across the Perth rail system. My guess is it’s a mix of the benefits of the new line serving destinations previously difficult to reach, and the halo effect — oh, look at that, a new rail line just opened — it looks so modern — I haven’t caught a train in ages, but maybe I should take another look and see if my local trains are any good… oh, they’re more frequent than they used to be… I’ll give it a go. In this short video about the creation of the Washington DC ads, they note (at about the 3 minute mark) that the campaign increased overall awareness of Metro, and helped contribute to very strong patronage on the new line when it opened last year. Most of us don’t look as happy as the people in the first ad when riding trains. But I think the “Good times are ahead” message resonates because it reminds us of something important — better public transport means better access to jobs and education and other opportunities — whether or not you can drive — and an option for getting out of the traffic. I can say with some certainty that my life is better thanks to good access to PT. So too the Regional Rail Link will be of huge benefit to the residents of Wyndham Vale and Tarneit — and the frequency boost expected on the rest of the Geelong line and on the neighbouring lines thanks to freed up capacity will also help many others. In Victoria, we seem to have an awful lot of trouble promoting the good things about public transport. There’s certainly political promotion — this week I’ve received two sets of flyers about the forthcoming level crossing grade separations; at the station, AND in the mail… and let’s not forget ridiculous ads for non-existent infrastructure like last year’s promotions of the proposed airport line — designed not so much to promote the line, as to influence your vote. But there has been virtually no promotion of the new RRL line, the trains that now run every ten minutes, the fare cuts in January, or the realtime mobile Smartbus information. With the huge investment now going into the system to produce these upgrades, it’s time PTV and the government started better promoting projects as they are completed, to ensure people know about the benefits, and the return is maximised by getting more passengers on board. Public transport in the media is so often dominated by bad news — crowding, delays, breakdowns — the good news stories need to be told as well. The appallingly catchy tune is Melbourne band Architecture In Helsinki. I once saw them in support of Belle And Sebastian and was thoroughly unimpressed. Perhaps they were having a bad night.